The man was really doing some light push ups as part of his stretching routine possibly before starting jogging. 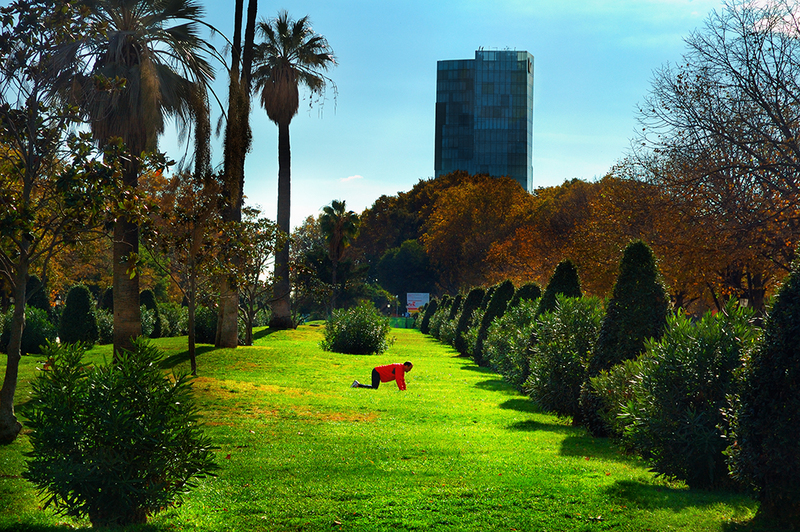 Parc de la Ciutadella is the perfect place to practice outdoor sports early in the morning but bear in mind that on certain days this hot spot in flooded with people engaged in some cultural activity. Have a nice weekend my friends. What does "cultural activity" refer to? More exercises or something else? The colors here are stunning! It looks like you may have used the Lomo effect. I like! Hey, Carlos, I think he needs a jogging partner! Didn't you say you wanted to get backing to jogging? Lovely park photo! Luscious colors and I'm glad someone your subject is taking an interest in good health. hey Carlos. Great photo! My latest book, "From Barcelona: Stories Behind the City Vol. 1," (ISBN 1905430744) has just been published. It's a collection of ten shorts starring the tourist, Gt. George, a ghost, Antoni Gaudi and many others. If you'd like a free PDF copy, let me know at www.frombarcelona.com! Looks like a very pretty place to exercise! Was it really that sunny and warm the Saturday after Thanksgiving? This makes me miss Barcelona! breathtakingly beautiful...wish i was there...stretching my arms to the sky amidst the abundance of nature. more of it please.